Catawba College, a small liberal arts college in Salisbury, North Carolina, packs a large wallop when it comes to American campuses noted for sustainability. It is one of only 21 colleges nationwide to receive the highest possible green rating from the Princeton Review. And Catawba now is one of the latest additions to the growing Rachel Carson Campus Network (RCCN) that links faculty, staff, students and administrators to environmental leaders nationwide. RCC President Dr. Robert K. Musil was the featured speaker at Catawba’s Center for the Environment and met with students and faculty while teaching two classes in introductory environmental studies. Musil was hosted by Dr. John Wear, Professor of Environmental Science, and the Director of the Center for the Environment which he established nearly a quarter century ago. Wear gave a tour of the Center’s state-of-the-art green building, one of the earliest built in the nation. In fact, it was designed and constructed before the widely-used LEED certification system for sustainability had even been developed. 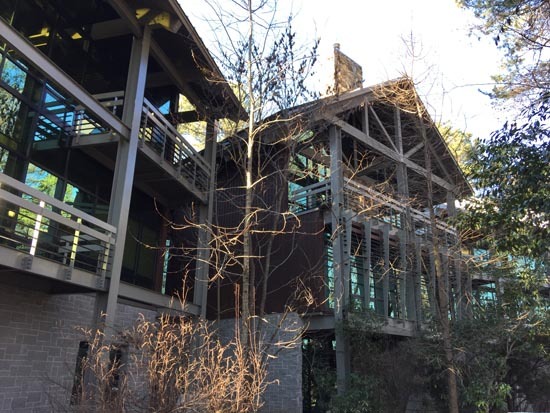 The Center is nestled in the 189-acre Fred Stanback, Jr. Ecological Preserve with a small lake and hiking trails. The entire campus is going solar with a Catawba solar initiative, which will produce more electricity than the solar installations of all other colleges and universities in North Carolina combined. The Center for the Environment now also hosts a National Environmental Summit for students each year. Students work and research in the Fred Stanback, Jr. Ecological Preserve and surrounding North Carolina areas. They are taught and mentored by a distinguished faculty, including national environmental leaders like Amory Lovins, founder and President of the Rocky Mountain Institute. The Institute, along with the Environmental Working Group, will co-sponsor this year’s Student Summit, titled “Redesigning Our Future.” Heather White, long-time Executive Director of the Environmental Working Group, will keynote the event. Following his visit to Catawba, Bob Musil was added as one of the key speakers and environmental leadership resources for the Summit.